Carousel pipe organs, Fairground organs, and monkey organs. Who has not lingered in front of an old carousel challenged by the resonance so unique to the monkey organs? Certain carousels were marvels, imposing, overflowing with Art Nouveau sculptures sparkling pavilions of copper discretely arranged in the forms of scalloped shells. A surprise to ones ears; one catches ones breath enthralled by the resonance, the beauty, the majesty, the magnificence! The public infatuation with these carousels at the end of the 19th century lead to manufacturers producing other instruments: fairground organs for outdoor carousels. It is these that live on in our memories. 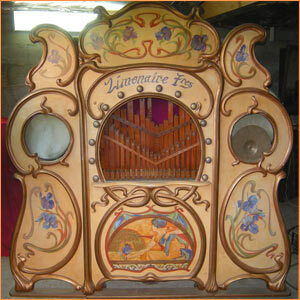 Simultaneously, another type of monkey organ emerged - the street organ. Carried with a shoulder strap or pulled by a cart; these are the ones that have more often survived. Accessible today, as they were in the past, these instruments are a collector’s delight. These sturdy machines, often used at school or municipal fetes, continue to please the crowds. Ever popular, the monkey organs are the instruments that, once properly restored, remain extremely attractive. We have at our disposal an abundance of important documentation enabling us to provide you with information, history and additional research.